WOW! 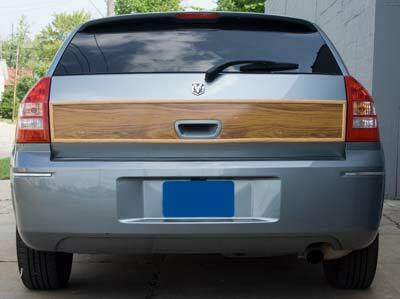 The Magnum Woody “Wood” Kits are the coolest re-styling package for your Magnum! The “Woody ” Kit is designed to replicate the early woodys with a “new”modern style. Unlike other woody kits the “wood” extends around the top of the doors and hatch area to blend in gracefully with the overall design, complementing the overall look and feel of your Magnum. Our “Woodys ” have won numerous awards for us, and our customers, including “Best in Class” at the prestigious 2001 Detroit Autorama! The attention and “thumbs up” it receives on the street makes every day a car show! This is not just another “graphics” kit, or expensive, maintenance intense, “real” wood. The "Cheyenne Teak” panels are a durable vinyl with an extra UV laminate overlay, and the outer “Santa Rosa Oak” trim is aproprietary raised quarter round plastic molding that covers the edge of, and rises above, the “Teak” panels. This gives your Magnum a true 3-deminsional light and dark “wood” surface just as the original Woody's had.